Nothing spoils that festive feeling more than having to fight your way through the high street crowds in order to buy gifts for your nearest and dearest. Even if you choose to do most of your shopping online, the stress of deciding what to buy is enough to make you hit the eggnog early. However, there is no need to worry about any of that this year, as our Christmas Gift Ideas are here to save the day. Our exciting range of festive suggestions will offer something different for those special people in your life and ensure there are plenty of smiles around on Christmas Day. They range from experience days and vouchers to short breaks around the UK and further afield, offering the chance to unwind following the busy Christmas period or head off on a well-deserved break. Maybe you know someone who would love a day at the ‘Bond in Motion’ show in London, or perhaps you would like to treat yourself and your partner to a shopping trip in New York. 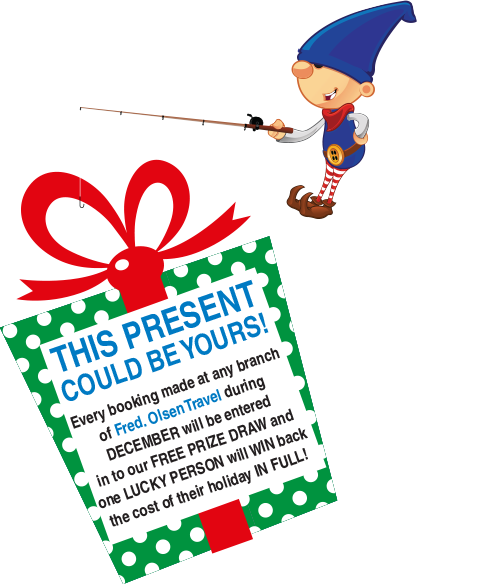 If you’re not really sure which of the options is appropriate, though, we are also offering travel vouchers which the recipient can use towards any trip with Fred. Olsen Travel. If you are planning your holiday at this time of year, though, there’s the chance you could get it for free when you book within the month of December. Simply arrange your trip at any of our travel agents in East Anglia or on the south coast, between December 1st and 23rd 2015, and one lucky person will be chosen at random to have the full price of their holiday refunded*. What a Christmas present that would be! If that doesn’t encourage you to drop in over Christmas, perhaps the complimentary mince pies and mulled wine available during the week of the 14th December to the 19th will. Come along and help us spread some yuletide cheer. *Terms and conditions apply. Prize will be drawn at random from any booking made at a Fred. Olsen Branch between the 1st and 23rd December and the winning customer will be contacted on Christmas Eve.